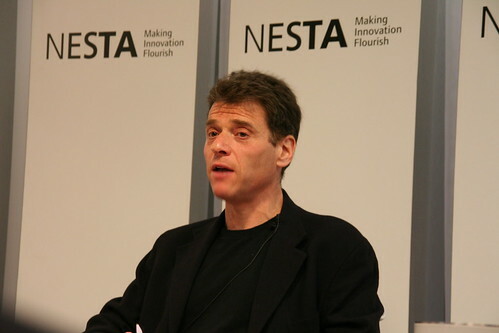 Monday night, I wandered over to NESTA for a debate between Andrew Keen and Charlie Leadbeater, to promote the launch of Charlie’s book We-Think. I think this is about the 3rd or 4th time I’ve seen Keen in action and of them all, I enjoyed this the most, as he seemed less likely to try and make cheap shots at the web but got far more into the topic of the evening – the book. Keen thinks the book is fantastic, the best at making the argument that he does no agree with, that it is a profound book. Keen thinks that individuals will still be the key drivers of innovation moving forward, whereas the book postulates innovation will be more group driven. He agrees with the idea that the true innovators are the nerd, the academic, the hippie and the peasant – but not that they would work together. Charlie thinks one of the key issues is how collaboration and participation will unfold. For many organisations and areas it could take 50 years for this type of innovation to take hold. Four key questions – how far will it go 9into health, education, banking? ), how far will it spread geographically, how fast will it spread and whether it will be bad or good for us? On balance, he thinks it will be good, but not necessarily for all. Charlies thinks the web is allowing us to move back to behaviours that were prevalent before the 20th century – folk collaboration, peer to peer distribution etc. One of the most interesting audience questions was about how the research and promotion had changed their minds. Charlie confirmed that even when putting the draft on line for collaboration, it did not do the wrok of a professional editor (there were only about 20 people who contributed usefully). 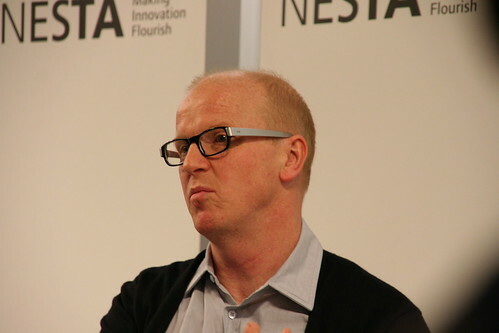 Andrew stated that he has got a lot more optimistic since he wrote the book about the future of the web, that the next evolution is likely to see an increase in ‘professionals’ bringing more, to curation and editing, that we’ll get a lot more tools to share this expertise. I enjoyed the debate and the conversation after! A good evening, with some challenges to the mind. This entry was posted in conference and tagged andrewkeen, charlieleadbeater, we-thin by Rachel. Bookmark the permalink.